Rajinikanth's 2.0 is releasing in over 650 screens in Tamil Nadu and expected to get a good opening at the box office, but the chances of beating Sarkar record are slim. Rajinikanth's 2.0 is ready to set the box office on fire. The Shankar's creation is hitting the screens in two days and gearing up for a big opening even as the industry is eagerly awaiting to see whether it becomes the biggest opener of Tamil Nadu by shattering the record of Vijay's Sarkar. 2.0 is estimated to be releasing in 650 screens in Tamil Nadu. Although the advance booking is yet to gain momentum due to various issues, the tickets for the majority of the shows are expected to be sold out by the time the movie gets ready for its first day, first show. Released in over 650 screens, Sarkar had the advantage of Diwali holiday season and made a record breaking collection on the opening day by raking in Rs 31.6 crore. This is the biggest opener in Tamil Nadu after Vijay's previous film Mersal which had minted Rs 24.2 crore on the opening day. Looking at the current trends, Rajinikanth's film is unlikely to surpass the first day collection of Sarkar as the movie is working day and not a holiday. 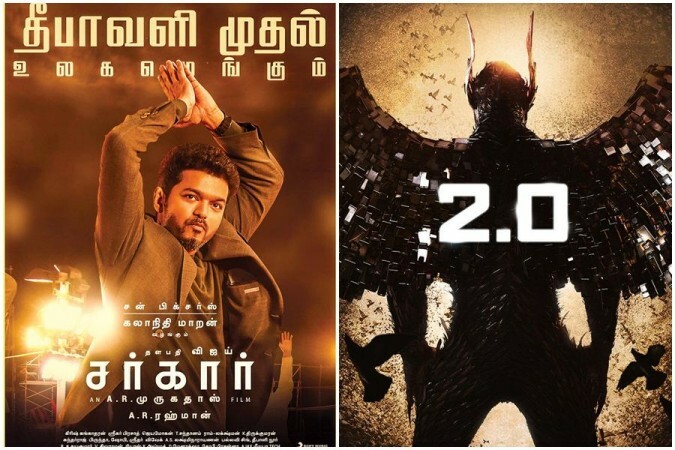 Although the ticket price for the 3D shows might be higher than normal, the chances of 2.0 surpassing the collection of Vijay-starrer are slim. It is simply because the full-fledged advance booking has not started yet in many centres. Usually, the tickets for most of the opening-day shows used to be completely sold out by now which is not the case with the Rajinikanth's film. Nonetheless, 2.0 has the potential to become the highest-grossing movie of all time if the movie opens to positive reviews.